Lancs: Grey Phalarope's, Gannet - 14th Sept 2011. A single Common Tern, 2 Dunlin and 1 Green Sandpiper were the meagre rewards from three hours on the local patch, Brockholes NR LWT, during the morning. Late morning, and a call from Cllr. 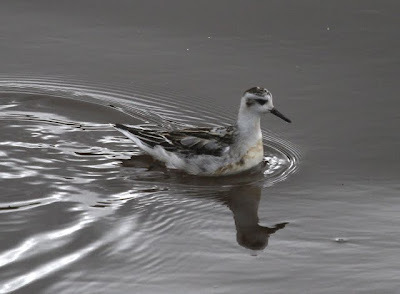 John F. Wright saw me heading for the Lancs coast and specifically Fairhaven Lake, Lytham St. Annes where a Grey Phalarope had been present for a couple of days, and which was a "photographers dream" according to Cllr. Wright. 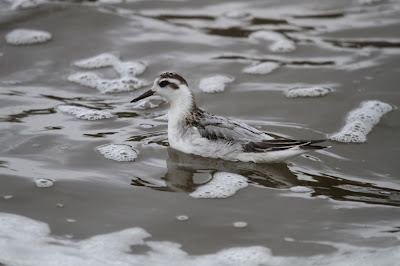 Above: Grey Phalarope - Fairhaven Lake, Lancs -14th Sept 2011. 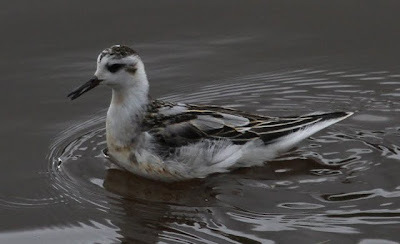 The Phalarope was indeed superb, but with things to do I elected to return home via the Preston by-pass. 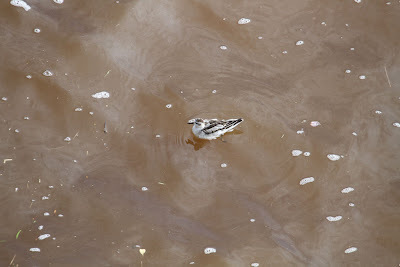 Upon reaching the A59 road bridge over the River Ribble at Penwortham, a glance upstream as I drove across revealed something on the water that looked like a large, mainly brown bird with a paler head. I couldn't eliminate the possibility of a Gannet from the view, so I pulled in at the first available layby and walked back with binoculars and DSLR to find a wrecked 2cy Gannet. Excellent. 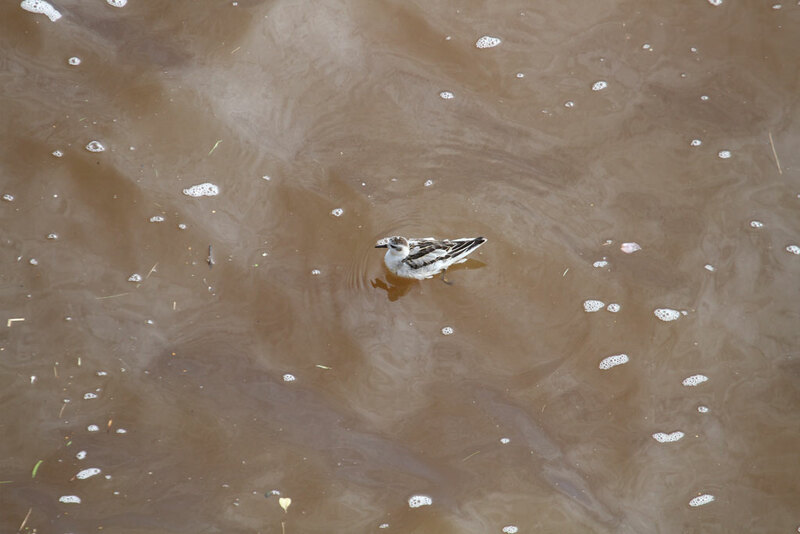 Walking towards the centre of the bridge to obtain a few record shots, I glanced at the water below to be stopped in my tracks with a naked eye view of what looked to be a Phalarope on the water mid-river! 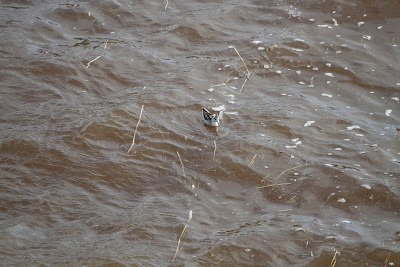 Below: Grey Phalarope on stretch of River Ribble in vicinity of A59 'Guild Road' Bridge, Preston, Lancs - 14th Sept 2011. Above: Taken from the A59 road bridge. The Phalarope then flew upstream and landed distantly, just upstream from Penwortham Bridge. 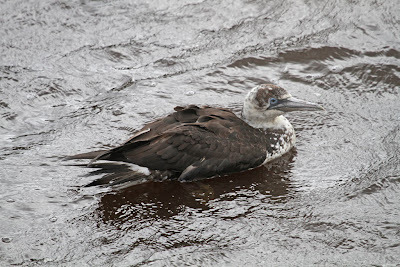 After much frustration trying to find a route to get closer to the bird, I eventually succeeded briefly before the bird disappeared and it took the best part of another hour to re-find it, this time well downstream of the A59 road bridge. 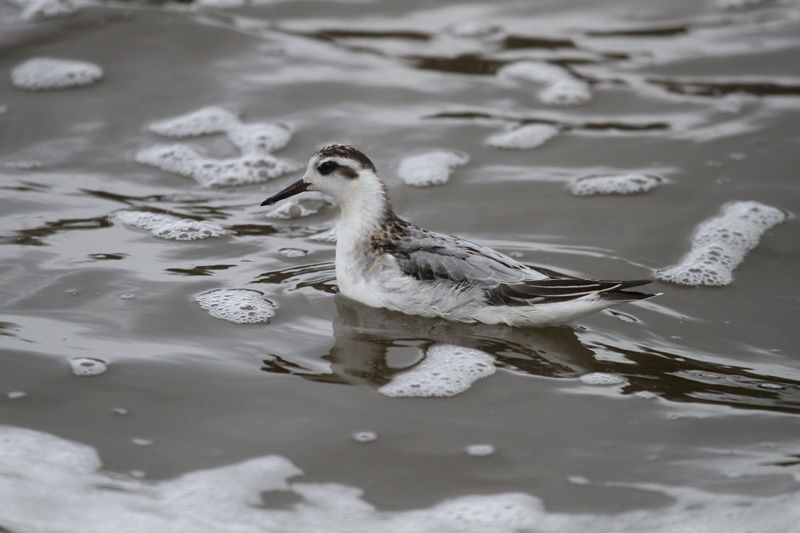 Both the Phalarope and the Gannet was last seen steadily drifting downstream on the ebbing tide, c500m downstream of the A59 bridge. 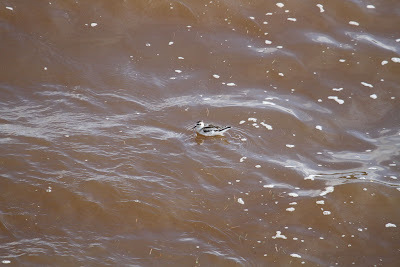 Above & below: Grey Phalarope, A59 road bridge, River Ribble, Preston - 14th Sept 2011. 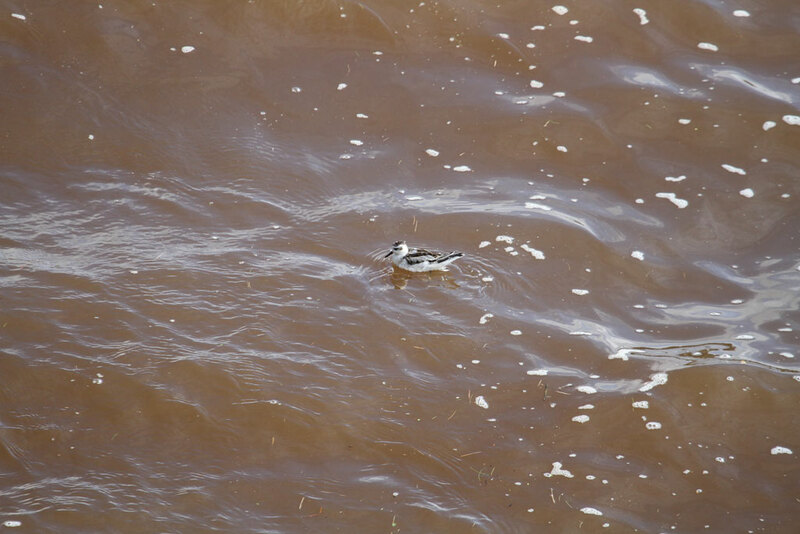 This is the first inland bird I have found. Above: 2cy Gannet on Stretch of River Ribble in vicinity of A59 'Guild Road' Bridge, Preston, Lancs -14th Sept 2011.